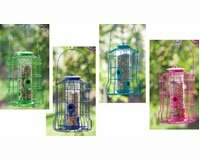 Blooms Squirrel Resistant Cage Feeder (Set of 4) by Evergreen Enterprises, Inc at Go Plots. MPN: 2BF300. Hurry! Limited time offer. Offer valid only while supplies last. 2BF300 Features: -Material: Metal and plastic. -Squirrel resistant design. Orientation: -Hanging. Color: -Green / Dark Blue / Light Blue / Pink. 2BF300 Features: -Material: Metal and plastic. -Squirrel resistant design. Orientation: -Hanging. Color: -Green / Dark Blue / Light Blue / Pink. Feeder Type: -Caged. Dimensions: Overall Height - Top to Bottom: -9.84". Overall Width - Side to Side: -4.13". Overall Depth - Front to Back: -4.92". Overall Product Weight: -0.69 lbs.